The Carousel of Farib and Reah Kari has started already by this regime.When will people learn that these people are not to be trusted one iota. "Fetneh" translates to "sedition" and much of the political establishment is still sore over the attempted coup by the losers of the 2009 election. So far the rumors over cabinet picks appear to be holdovers not unlike what we here in the U.S. have come to expect when a Democratic administration takes over from a Republican one and vice-versa. Sedition is the literal translation of the word Fetneh. The word, however, is used in Iran to designate the Green Movement of 2009, when hundreds of thousands of people marched on the streets to protest what they deemed as government’s fixing of the presidential election results. The movement was crushed and eventually defeated by Basij and security forces, with casualties and thousands imprisoned, including the detention of two of its leaders to this day. The Green sympathizers were a major force in the victory of Hassan Rouhani in June presidential election. The new cabinet needs to signify a coalition government to be successful. Rouhani has pledged to propose ministers with different political leaning. The issue brought up by Shariatmadari in his editorial piece, is the extreme right’s displeasure of any ministerial posts going to the reformists. Hence his call on Majlis to cast no-confidence votes against any reformist/moderate minister, basically the supporters of former presidents Rafsanjani and Khatami. He does not realize, or does not want to admit, that Rouhani is also one of them and based on the overwhelming mandate given to him by the public last month, it is so natural that he invites leading reformists and moderates into his coalition cabinet. Shariatmadari and the people around him do not want to admit that they lost the election, and the elections have consequences. He wants the Majlis undo the election results, now that the right lost at the polls. Hope Majlis ignores his call, the cry of a loser, and approves the formation of a coalition government so much in need for the country in this time of crisis. Looks like this article and some commentators are trying to implement the famous strategy of enemies called "Divide and Rule"...., for that purposes they use person's statements out a context of their intensions.
" finally with this comment ,you have revealed you are in the leash of the IRI".............-which is a crime to you!! ISN'T IT? Uskowi -YOU are too general !-Shariatmadari is a journalist .An independent voice in the free media.highliting the relations of kayhan and the office of the leader is an attempt on your part to create a storm! and maybe convince your readers that the establishment is 'undermining' the new President. we should realize that Iran is an open religious democracy-a Commander,an editor,or even a cleric can express his personal views touching on some sensitive subject and this may not necessarily reflect the office of the Leader!. 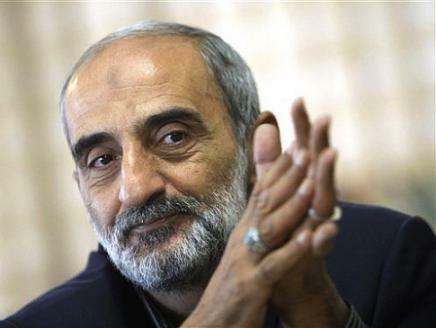 Shariatmadari is the OFFICIAL representative of the supreme leader at Kayhan. Please do some research before launching your personal attacks! Shariatmadari is indeed undermining the new president, on behalf of the most powerful ultraconservative faction within the Leadership House. Now, tell us what do you think of Shariatmadari’s call on Majlis to vote no to Rouhani’s ministers deemed to be moderate/reformist, after his side lost so miserably at the polls? Shariatmaderi’s statement was very clear and precise: He has called on Majlis to cast no-confidence votes for the ministers he cosiders moderates and reformists. What makes Shariatmadari’s comments more disturbing is the fact that he is the official representative of the supreme leader at Kayhan and as such officially part of the Leadership House. As said before, he is believed to represent and speaks for an ultraconservative faction within the Leadership House that control the security apparatus in the country. In fact by his editorial, Shariatmadari is not only undermining the new president, he has declared war on all moderates and reformists. Isn’t that amazing considering that his side lost so miserably at the polls only a month ago? His faction does not represent the majority of the Iranian people; but they are clinging to power by controlling all security apparatus of the country, including IRGC Intelligence, as well as the Judiciary. Now they want to undo the popular vote and stop Rouhani to form a government of factional unity, which must include reformists and moderates, Rouhani’s main supporters. He is indeed playing the politics of division, not unity. I agree with Anon 7:59 PM.Not that we didn't know about his shenanigans,but Mark has been caught red handed with his comment. It also shows that in the Islamic Republic, meaningful people can more express their controversial views and not be "lynched" for their views like it happened in the US to the famous reporter; journalist Helen Thomas and others..
Lynching is part and parcel of the type of regime we have in Iran. By reading latest articles of the author, it has been emerging his strategy that assumes Rouhani's "separation" from the Islamic System, by accusing the system that it creates obstacles for Rouhani or distorts his words (wiping israel off), in order to show that it is the Islamic system that paralyzes Rouhani's actions, not the West one. Curiously the author, despite his recent "informational article", has no his own significant comments avalable, about the recent legislation by the US House of Reps., to impose additional sanctions. His recent strategy is to blame the Islamic system in order to deflect attention from the West's aggressions and actions...against Mr. Rouhani.